"This is a delicious fig cake." Preheat oven to 350 degrees F (175 degrees C). Grease and flour a 10 inch tube pan. Place the stewed figs into a saucepan, cover with water, and simmer on low heat for about 5 minutes. Drain and cool, reserving 1/2 cup of the liquid. Cut the figs into 1/4 inch cubes; set aside. In a medium bowl, combine the reserved fig liquid and buttermilk; set aside. Sift together the flour, baking powder, baking soda, salt, cinnamon and cloves; set aside. In a large bowl, cream together the butter and sugar until light and fluffy. Beat in the eggs one at a time, then stir in the vanilla. Beat in the flour mixture alternately with the buttermilk mixture. Stir in the chopped figs and walnuts. Pour into prepared 10 inch tube pan. Bake in the preheated oven for 50 to 60 minutes, or until a toothpick inserted into the center of the cake comes out clean. Cool in pan 15 minutes, then turn out onto a wire rack and cool completely. Swirls of cheesecake inside a pumpkin-spiced cake! Moist and fluffy! Works well with fresh figs= 1lb. Added lemon zest for extra aroma. Nonfat yogurt can be substituted for butter milk. I usually don't bother writing reviews, but this recipe is amazing. I substituted the buttermilk with my homemade yogurt and it turned out great. It is now my absolutely favorite recipe. very good recipe. 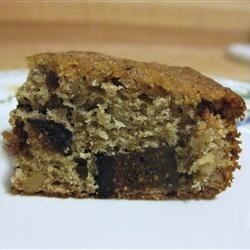 although i love figs, i don't care for big chucks of them in the cake so i pureed them. cake turned out even better.